For 18-year-old Damola Morenikeji, Muse is one good force that he is not in a hurry to end his friendship with. This is because since they had a contact when he was nine, the ink of his pen has been flowing ceaselessly, with five books to show now. 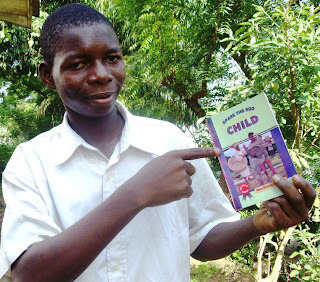 The Federal University of Abeokuta student, who hails from Ogun State, says his writing skill was discovered by his parents when he was six years old. He states, ‘‘They encouraged me and simultaneously taught me that there is a time for everything. In 2002, while I was concluding my primary school education – at the age of nine – I was challenged to write my first book. That challenge gave birth to the book, ‘Spare the rod and spoil the child’. In 2003, while preparing for a promotion examination, I wrote another book titled ‘The Glorious Child’, a book that talks about the erroneous belief people have about educating the female child. In 2004, during the long vacation, I wrote the third book titled ‘No Other Chance’. According to him, the titles of his other books are ‘A stroll to the Animal Kingdom’ and ‘The evil that Money do.’ His latest work is ‘The So-Called Police,’ which he says, has yet to be published. The author, who studies Plant Physiology and Crop Production says that they are plays but he is still working on prose and poetry. He adds that he writes to effect positive change in society. He, however, notes that it had not been easy publishing the books due to the challenges he often faced with funds. ‘‘It is quite unfortunate that after several budding writers get their manuscripts prepared, they do not many publishing outfits willing to publish their works. Most times, they have to fully bear the cost of production,’’ he explains. Because of the impact of his works Morenikeji emerged the Second runners-up during the 2006 Artiste of the Year Award of Excellence organised by the state. Note: The above article was published by Punch newspaper on Tuesday, 24th January, 2012.